Crisp comforting Waffle Iron Quesadillas, made with airy waffles and tons of Tex Mex flavor! Earlier this year I was enjoying an enormous serving of Chicken & Waffles at a local diner. In the middle of a big sticky bite, dripping with maple syrup, it dawned on me that I would prefer all my breakfast items to be savory instead of sweet. I love maple syrup and all sorts of sweets and treats. Yet when it comes to breakfast, I tend to lean towards salt and spice to flavor my food. We sat there eating some of the best Chicken and Waffles we’ve ever tried, and all along I was thinking I would have preferred a waffle and chicken sandwich, skipping the syrup all together. Waffles are one of the most under utilized foods on the planet, in my humble opinion. Not only do they make a lovely platform for fruit and maple syrup. 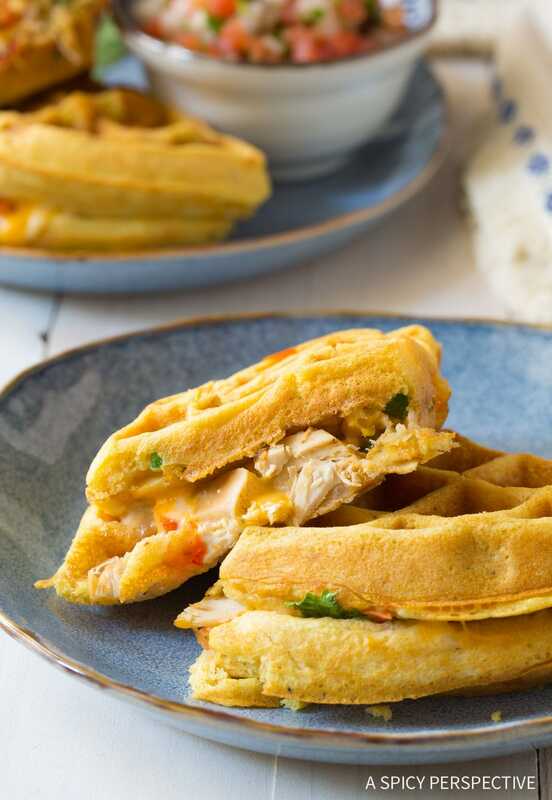 They can also be used as bread for sandwiches, as crust for pizza and flatbreads, and of course in place of tortillas, as in today’s Waffle Iron Quesadillas recipe. 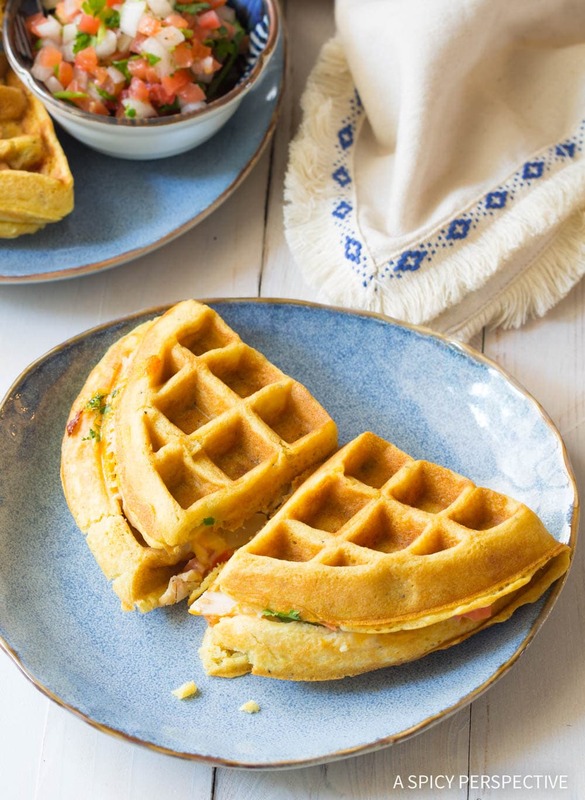 The crisp airy texture makes waffles the perfect carby base for all sorts of creative mash-up recipes. Plus, the honeycomb texture offers little pockets to hold in all sorts of goodies. 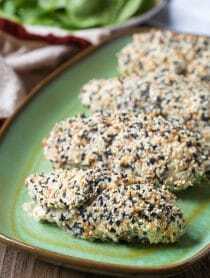 I tested this recipe several different ways in order to get the best overall flavor and texture in the shortest amount of time. 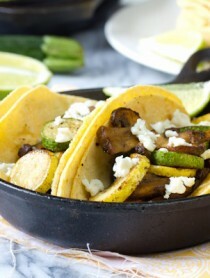 You could cook your vegetables in a separate skillet in order to have more substantial fillings on the inside. However, I found that if you dice the onions and peppers and lay them on top of the waffle batter before closing the waffle iron, they cook as the waffle cooks, and sort of work their way down inside the waffle. It’s best to make the waffle batter first, before you do anything else, so it has time to rest a little before going in the waffle iron. 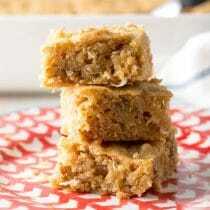 Mix the flour, cornmeal, cornstarch, sugar, baking powder, baking soda, salt, pepper, and garlic powder together. 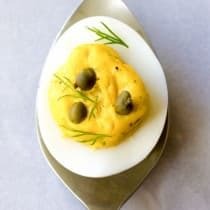 Whisk in the eggs, melted butter, and milk. Seltzer water is added right before cooking, to create an ultra light bubble texture on the inside of the waffles. Prepare all the quesadilla fillings. When you are ready to start cooking, whisk the seltzer water into the waffle batter. Ladle the waffle batter onto the hot iron. 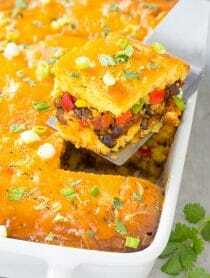 Sprinkle diced onions and peppers over the waffle batter and close the waffle iron. Cook for approximately 2 minutes, until lightly golden. 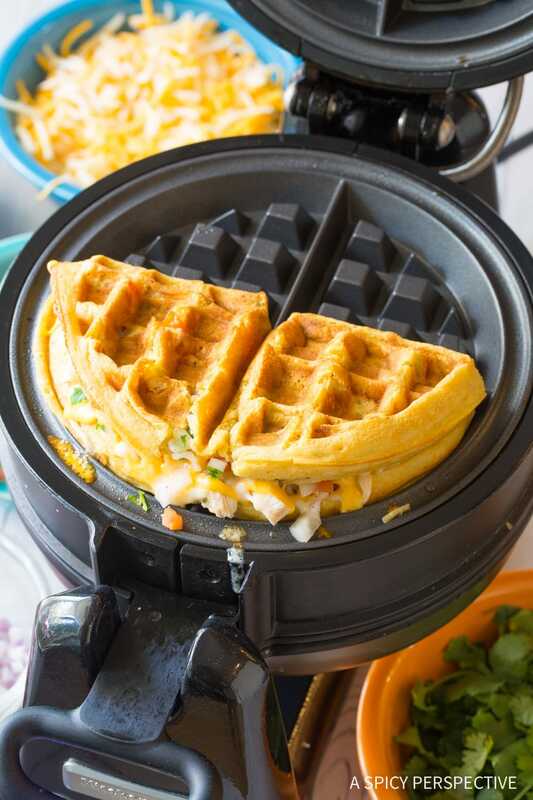 Open the waffle maker and sprinkle shredded chicken, cheese, and pico de gallo over half of the waffle. Fold the other half of the waffle over the top of the fillings and close the waffle iron again. Cook for 2-3 minutes to heat the fillings and crisp up the edges. Repeat with the reaming batter and fillings. To get the waffles really crispy, it’s best if you have a high powered waffle iron. Crank the heat all the way up! Also warm the oven (or a warming drawer) to 150-200 degrees F, so the finished Waffle Iron Quesadillas can stay warm and crisp until you have cooked all of them. 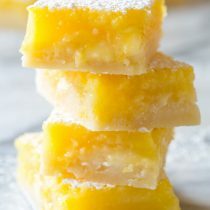 It’s tempting to throw all the ingredients into the batter at the same time. Yet reserving the seltzer water until the end, and layering the dice veggies on top of the cooking waffle batter really does make a difference. Make sure to spray the waffle iron with nonstick cooking spray, or brush with melted butter in between each waffle, so they don’t get stuck. 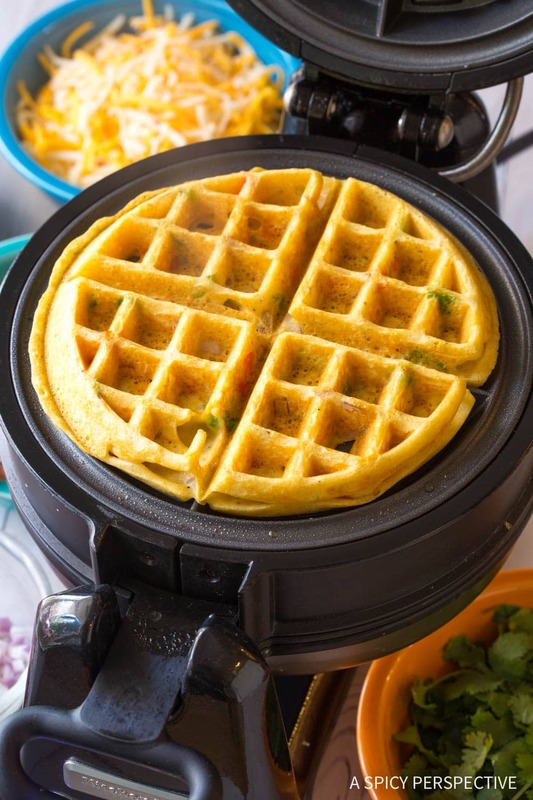 Find a scoop that allows you to pour enough batter into the waffle maker so it spreads all the way to the edges, without spilling over the sides. Waffle makers range in size, so consider the first waffle a tester. Usually a 1/4, 1/3, or 1/2 cup scoop will do the trick. In this recipe, I’m using cooked shredded chicken, shredded cheese, and pico de gallo as the main fillings. However you can use any filling you like! And don’t forget the dips and toppings. Salsa, guacamole, and sour cream are good options! 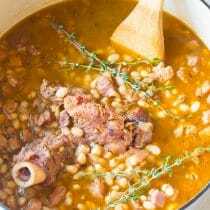 And see all our easy clean-up One Pot Recipes Here! 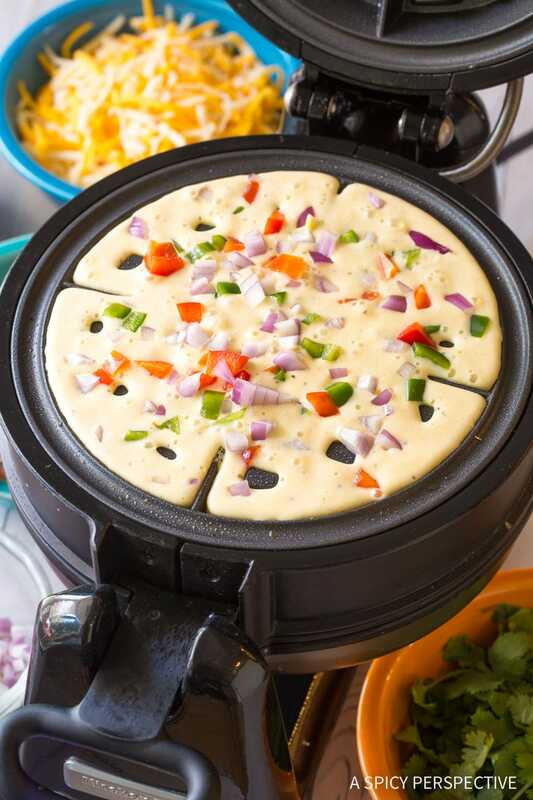 Easy Waffle Iron Quesadillas - A classic quesadilla recipe with a twist! 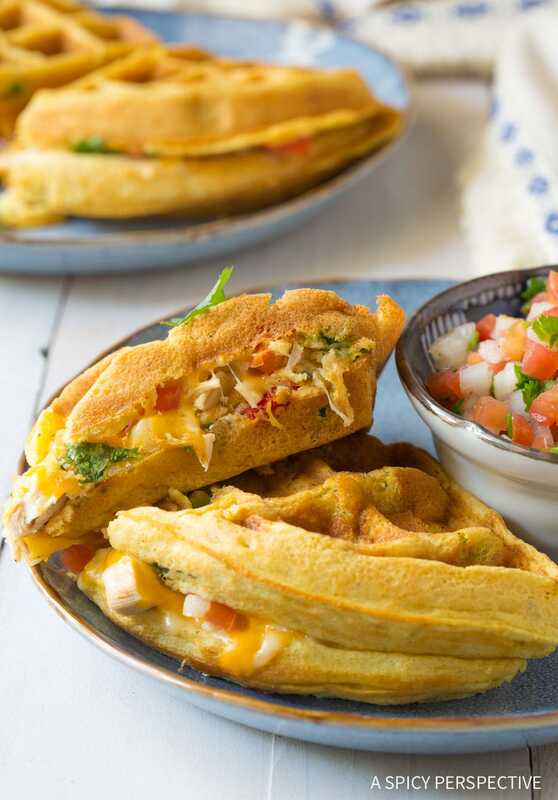 Tex-Mex fillings folded into a crisp zesty waffle make a unique hand-held meal! Preheat a waffle iron to the highest temperature possible. In a large mixing bowl, whisk the flour, cornmeal, cornstarch, sugar, baking powder, baking soda, salt, pepper, and garlic powder together. Whisk in the eggs, melted butter, and milk. Allow the batter to rest reserving the seltzer water for later. Meanwhile, chop and prep all the quesadilla fillings. When you are ready to start cooking, whisk the seltzer water into the waffle batter. Spray the hot waffle iron with nonstick cooking spray. Ladle the waffle batter onto the hot iron. Use enough batter to cover the waffle iron without spilling over the edges, usually around 1/3 cup. Sprinkle diced onions and peppers over the waffle batter and close the waffle iron. Rotate the waffle iron (if your waffle maker offers that option) and cook for approximately 2 minutes, until lightly golden. 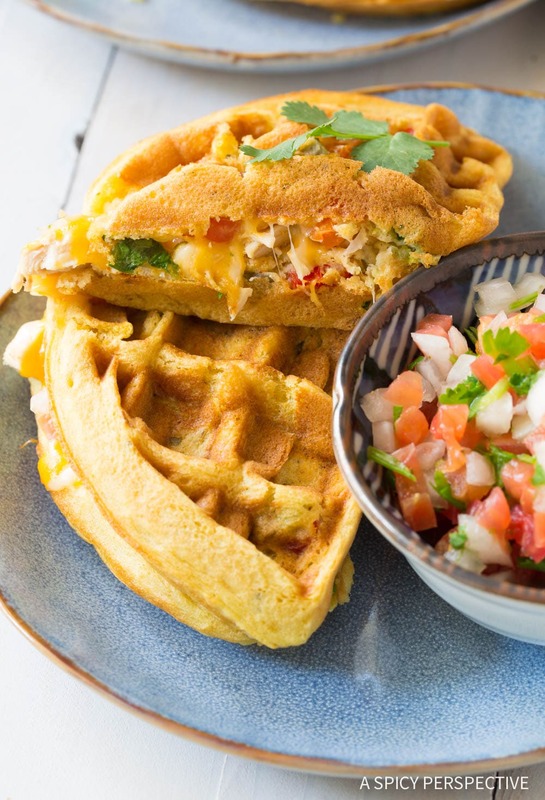 Open the waffle maker and sprinkle shredded chicken, cheese, and pico de gallo over half of the waffle. Use wooden tongs to fold the other half of the waffle over the top of the fillings and close the waffle iron again. Cook again for 2-3 minutes to heat the fillings and crisp up the edges. 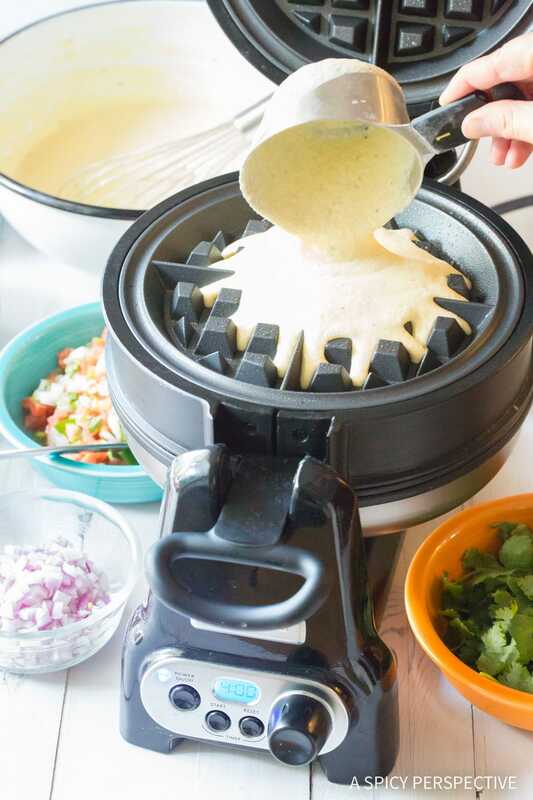 Carefully lift out of the waffle maker and serve while hot, with guacamole and sour cream if desired. Repeat with the remaining ingredients. NOTES: If you want to serve all your Waffle Iron Quesadillas at the same time, heat the oven to 200 degrees F, and keep the quesadillas warm inside the oven as you finish cooking the rest. 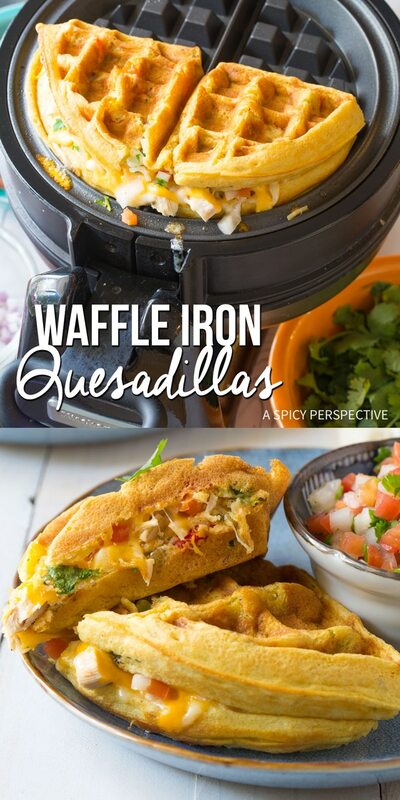 never knew waffles can be used to make quesadillas, love it and cant wait to try it! I never have seltzer, I separate the eggs, whisk yolks and add to liquid ingredients. Beat the whites til stiff then gently fold them into the batter, leaving little blobs of it. DO NOT stir it in. The waffles are always light and fluffy.